"It is hard to give a hug without receiving one in return." When I was growing up, I remember my mother saying, "Your friends are like elevators; they will bring you up or down - the choice is yours." . . .the three things that stop people more than anything else does from achieving their goals: criticizing, complaining, and blaming. These are the three horsemen of failure. We cannot be successful on our own. We need the help, support, and encouragement of those around us. When we find out that someone believes in us, it is powerful. Notice the word we in the word power. We are in power. A thought can be like a cloud just floating by, but a dream sticks to our minds like Velcro and becomes part of us. When our mind is in a practical state, just dealing with the information at hand, problems seem insurmountable, worries seem powerful, and life seems difficult. When we turn our mind to possibilities, the load seems lifted. 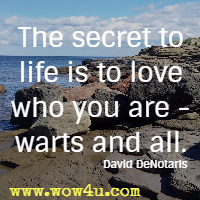 The secret to life is to love who you are - warts and all. Let go of the fears, worries, and doubts. If you have to write them down on a piece of paper and burn them, do it. Have a funeral for your fears, worries, and doubts. Let them rest in peace so that you can live, work, and play in peace. When we understand why we want something, fear and doubt will still show up, but we have the courage, momentum, and reasons to overcome the resistance. People are busy accomplishing their own dreams, so your dreams are left up to you. When you decide - that's a key word - to take care of your dreams, things start to happen. "There are two ways to build the tallest building in town. You can tear down everyone else's building, or you can build a strong foundation and use great support." "Don't let people discourage you from living your dreams." "Share your dreams with people who will help you make them happen." "When our energy level is up and our minds are open to possibilities, greatness just happens." "..there are no quick fixes and that we must not just go thorough a problem but grow through a problem." "Some people lighten a room when they walk in it, and others lighten a room when they leave it." "I have learned that everyone has something to offer; we just have to figure out what that some is." 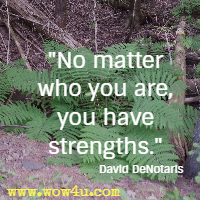 "No matter who you are, you have strengths." "Everyone has strengths and weaknesses, and it is important to show people that they can be involved, regardless of who they are or what physical limitations they have." "The best nation in the world is our imagination." "I have found that the imagination does not work to its full potential when we are lying on the couch doing nothing, but when we are with like-minded people." More David DeNotaris Quotes: . . .